There's a new team in the International League...sort of. The Richmond Braves have moved to the Atlanta suburbs. 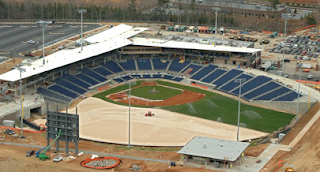 It's a reincarnation: the Gwinnett Braves. I grew up in Richmond, and I was kind of sad that they let their storied Braves franchise slip away...but what's not to like about a new ballpark in the Atlanta burbs. It's a great market for our league and a top notch stadium. 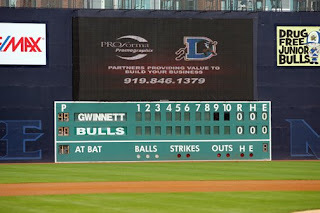 The Bulls were flattered to have several Gwinnett delegations visit our facility when they were designing their new ballpark. Also, the Columbus Clippers open their new ballpark this week. It's an embarrassment of riches: new diamonds in the International League. Triple A baseball bling! My roots are in broadcasting, and that compels me to post on the death of Phillies announcer Harry Kalas. What a set of pipes! …a most distinctive delivery. He died in DC on Monday in the broadcast booth preparing for a Phillies/Nationals game. He was 73. You may not recognize his name, but you are undoubtedly familiar with his work. Mr. Kalas was also the voice of NFL films. If you watch NFL slow-mo highlights - with the audio turned off - you will still hear his voice in your head! He was the soundtrack of the NFL. Harry was so good that if you wanted him to announce your reception entrance at your wedding, he would do it. All you had to do was call him and ask. Of course, he would send a recording, but it was like having him there. And he would do it gratis. That's how good he was and one reason he was so loved by the Phillie fans. Click here for a story from our web site (wralsportsfan.com), and listen to the poignant radio interview he did on 99.9fm The Fan during the 2008 World Series. Our condolences to his family, especially to his son Todd, a broadcaster for our Tampa Bay Rays. April is a month of high holy days for Christians, Jews, Hindus and Buddhists. This spiritual renewal (Easter in my tradition) intersects wonderfully with springtime and baseball...and many would claim baseball has its sacred aspects! Good and faithful God, as we come together for fun and fellowship we pause to acknowledge your greatness, to express our thanks, and to ask your blessing. You are the creator of life, the source of peace. You are our hope, O God. We ask you to help us build a more peaceful world, where justice reigns for all and no one is excluded from your abundant table. Thank you for Springtime. We are so grateful that the winter cold and icy surprises are over for another year. Our spirits are renewed by the budding trees and flowers, by the smell of new mown grass and fertile soil, by the warm breezes and longer afternoons. Thank you for tonight, in a special way for baseball, and the Durham Bulls. It is so good to return to this inviting stadium. May we have good times here and meet new friends. May we celebrate our unity and diversity as people of the Triangle, as neighbors and friends. Loving God, we thank you for visits with Wool E. Bull, for hotdogs, for fireworks, homeruns and sumo wrestlers. As we sing “Take me out to the ballgame” with Doc Watson, help us to forget our troubles, relax and unwind. We ask your blessing on our team and staff, on the companies who sponsor these games, and on our public servants who provide order and safety when we gather. Send us forth from this stadium as people who respect each other more, who are a little prouder of our community, and with renewed energy to build a better world beyond this ballpark. Thank you, O God, for the small things which make life so good – for Springtime, for good friends and good food, for music and laughter...and for baseball. Amen. I'm driving to work Monday morning, listening to ESPN Radio on 99.9 The Fan. The Carolina-Michigan State game is the big topic, but the schmoozing turns to the opening of baseball season. Mike and Mike share their predictions. Greeny says the Tampa Bay Rays will be the AL East wild card team and Golic gives them the championship outright. Am I dreaming!?! Pinch me! Baseball season is underway and our Tampa Bay Rays are in the conversation - not as the doormat, but as a contender! 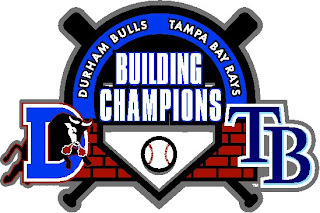 Tampa is shipping the AL championship trophy to Durham for an appearance at the ballpark on Friday and Saturday. Get your picture taken with it. This coveted hardware is no longer the sole possession of the Yankees or Red Sox. On Friday, LHP David Price will be on the mound for the Bulls. Price, USA Today's 2008 Minor League Player of the Year, will make his first appearance in Durham just five and a half months after getting the final outs of the AL Championship that propelled Tampa to their first World Series. ...and there’s more on Friday night: Price is the #2 ranked prospect in the country (by Baseball America) behind Baltimore Orioles catcher Matt Wieters, who is expected to be with the Norfolk Tides…so it’s #1 vs. #2 Friday night in Durham. Join us! 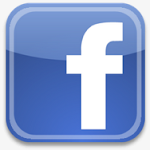 Buy and print tickets on line: click here. 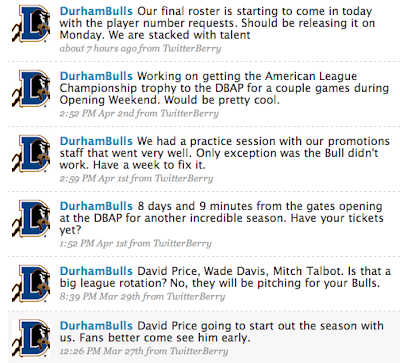 If you really want to know what’s going on behind the scenes here at the DBAP…then twitter with us. twitter is the latest Internet social networking sensation, and it has been embraced by Bulls’ General Manager Mike Birling. During the day, Mike broadcasts brief text messages (from his Blackberry) about ballpark happenings. 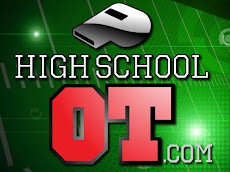 You can read them on twitter’s web site and/or on your cell phone. Still, the web is no substitute for the real thing...so make a personal appearance at the ballpark on April 9th. Opening Day. First pitch: 7:05pm.